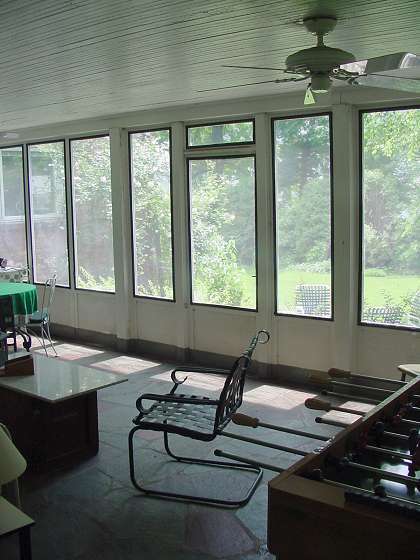 My latest house project is mounting clear plastic panels over the screened openings of our large screened-in porch. This space has not gotten as much use as it should (1) because the temperatures are only really comfortable for a month or two in spring and fall, and (2) because it is so open that dust and pollen covers anything left on the porch for more than a day or two. 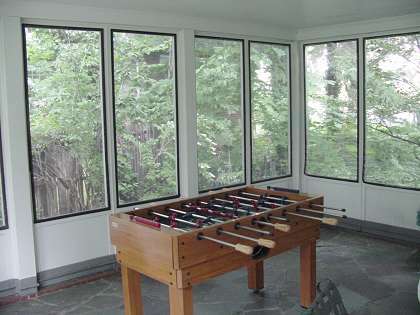 Screen Den Inc. manufactures the clear flexible plastic panels that I used. The panels mount securely with Velcro, but then can be folded down, rolled up or down, or removed entirely. The mounting on the screen side is Velstick: 1-inch wide stiff plastic strips delivered in 4-foot lengths, with the fuzzy side of Velcro on one side. The mounting on the plastic panel side is the hook side of Velcro, on fabric strips sewn onto the plastic. The plastic is also nicely edged with black fabric. ScreenDen's product is the least expensive of the three approaches I considered. Other companies manufacture rigid plastic sliding windows that divide each opening into four sections, so that up to three quarters of each opening can be open at a time. The estimate I got was almost seven times as expensive as the Screen Den approach. Still more expensive, and with tax and building code impact, would be the idea of having the space glassed in. The parts delivered were exactly the dimensions specified, and Screen Den made good right away when the amount of Velstick provided with the product was insufficient. The panels are delivered rolled up. The resulting wrinkles (seen in the small photo) fall out when the panels are installed taut and get some sun on them. The installation went very quickly and we are very pleased with the result so far. The stone-floored porch stays cool well into a hot muggy day without hot air blowing into the porch, and breezy evenings are comfortable. We are looking forward to what change we see in late fall and winter.